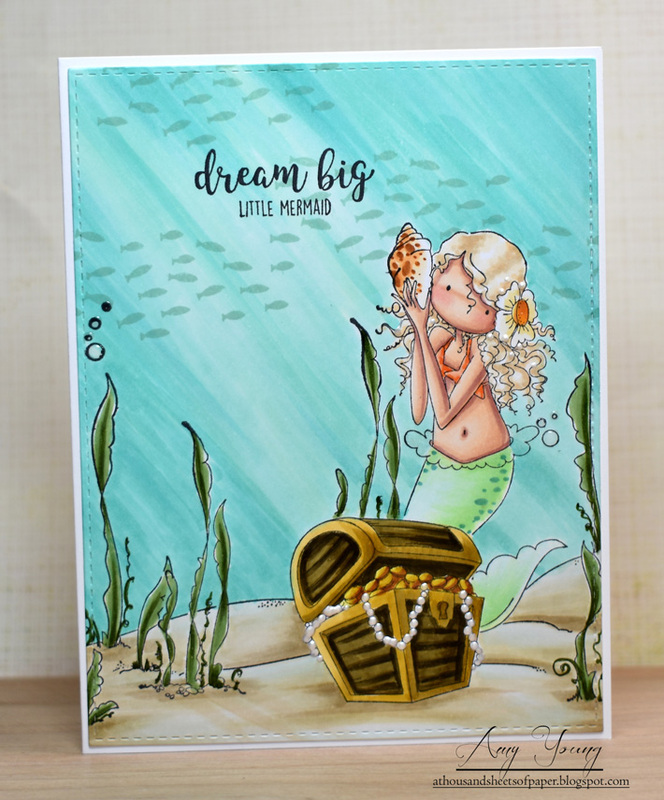 I've waited almost a year to ink up this fabulous Tiny Townie Mermaid set from Stamping Bella. Why the heck did I wait so long you ask? Well she wasn't released until after my month of mermaids so by the time I got her I had moved on seasonally with my card making and I am just OCD like that. But I can tell you right now that she was worth the wait 'cause boy did I enjoy making this card. I wanted to use the Under the Sea backdrop stamp to give her a bit of a home but I also wanted the card to stand vertical and the backdrop stamp is designed with a horizontal card in mind. So I decided to stamp the mermaid behind the treasure chest, creating a nice break that I could then stamp one side of the backdrop on and then move the stamp to get the other side showing and conveniently hide the seem. This worked out quite well if you ask me and now I'm wondering if I can't make the same trick work for some of my other backdrop stamps in the future. Next I got to coloring and I decided to keep the color palette rather soft and light since it seemed to suit her dreamy, romantic look. I just think she is gorgeous with all that curly hair floating around her. Anywho, I am entering this card into the Bellarific monthly challenge since it is an easy "anything goes" theme. Wish me luck and have a wonderful long weekend everybody! I agree there should be more Tiny Townie Mermaid/Mermen. Beautiful job btw. Hugs.